Many treatment plans benefit from immobilising a limb, whether it is healing from a break or recovering from an operation, but providing both immobilisation and elevation at once may require special equipment. 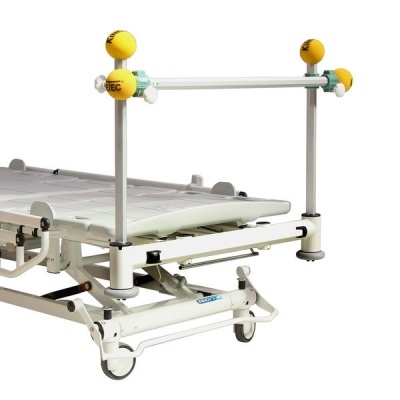 The Sidhil Innov8 Bed End Traction Kit is the solution, attaching easily to Sidhil Innov8 Beds to provide simple and safe limb immobilisation. The overhead, rectangular frame is designed for use with the Innov8 hospital bed range and is suitable for a number of procedures to help assist the patient's recovery. This Traction Kit is made with an innovative design, with a lightweight construction that makes it as versatile as possible. It can be easily manoeuvred from bed to bed, and is easy to store when not needed. Please be advised that the Sidhil Innov8 Bed End Traction Kit is usually delivered between 1 - 2 weeks of your order being placed. We would advise you to consider this delivery estimation before placing your order and apologise for any inconvenience that this may cause. For more information, please contact our Customer Care Team at 020 7501 0592.